It can’t be fun these days being the Democratic Speaker of the House…. And other House members won’t be returning your calls…..
And you’re gonna be asked a million times…. House Speaker Nancy Pelosi (Calif.) dismissed Democratic members who have distanced themselves from her this election cycle, explaining that she just wants them to win. Pelosi brushed off the handful of Democratic lawmakers and candidates who have run ads criticizing her, or who have not committed to supporting her as Democratic leader in the next Congress. Whitman wants to take a lie detector test? Never a good sign: California gubernatorial candidate Meg Whitman (R) said she is prepared to take a polygraph test to prove that she was “really stunned” to learn just last year that her housekeeper was an undocumented worker, CNN reports. He got his ‘push back’ up! You can watch the full speech below. It’s part ofa big push from the Obama White House to rekindle the campaign energy from two years ago in hopes of saving the House for the Democratic Party. “We cannot sit this one out,” Obama told the crowd, pegged at 26,500. That’s nearly 10,000 more than turned out for a 2008 rally in the same location. Also of note, embattled Sen. Russ Feingold (D-WI) showed up for the rally after all. His aides had told TPM he’d need to be in Washington for Senate business, prompting GOP cries that Feingold didn’t want to be seen with Obama. A new Washington Post poll in Maryland finds Gov. Martin O’Malley (D) leading former Gov. Bob Ehrlich (R) in the race for governor, 52% to 41%. In May, the race was tied at 47%. Among likely voters, Republicans now hold a three-point lead in the generic-ballot test for control of Congress, 46% to 43%, down from their nine-point lead last month. Among registered voters are split evenly, 44% to 44%. A new Reuters/Ipsos poll in Ohio finds Gov. Ted Strickland (D) has pulled into a virtual dead heat with challenger John Kasich (R). Kasich leads by just one point among likely voters, 47% to 46%, after holding a 9-point edge in August. A new Fox News poll also shows Kasich slipping and has him leading by just two points, 45% to 43%. Update: A new New York Times/CBS News poll shows Kasich with a 43% to 42%. In Colorado, Ken Buck (R) leads Sen. Michael Bennet (D), 47% to 43%. In Wisconsin, Ron Johnson (R) leads Sen. Russ Feingold (D), 52% to 44%. In Washington, Sen. Patty Murray (D) edges Dino Rossi (R), 48% to 47%. In Illinois, Mark Kirk (R) edges Alexi Giannoulias (D), 42% to 40%. In Ohio, Rob Portman (R) leads Lee Fisher (D), 50% to 37%. 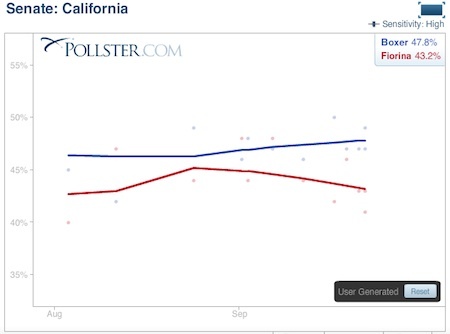 CA-Gov/CA-Sen: Dems start feeling some California ……. This would help the Democrats …. Democrats across America can hope that California is a harbinger of things to come. Because if there is one clearly discernible trend towards the Democrats in the 2010 midterms, it can be found in the Golden State. Boxer has pulled into a narrow lead in recent weeks, a fact confirmed even by Rasmussen and SurveyUSA, two pollsters that have been quite bullish on GOP prospects this cycle. In August, the four polls of the race split evenly between Boxer and her challenger. In September, Boxer has led in the last eight polls released on the contest, creeping into the 50s in this weekend’s Los Angeles Times poll, which had her up by nine. Recalcitrant Democrats might finally be coming home. Tom Jensen at PPP noted when they released their poll (PDF file) this month that the enthusiasm gap in California is not as acute as they have seen it elsewhere. The gap between the 2008 vote margin (+25 Obama) and the current sample by PPP (+21 Obama) was pretty minimal. Boxer always seems to close well. It is an article of faith among California Democrats that Boxer does better on Election Day than the polls would seem to predict. I checked out that theorem back in June, and found that (in 2004, at least) that was precisely the case. Baker creeps ahead of Patrick in Mass Governor race……. A new Boston Globe poll in Massachusetts finds Charlie Baker (R) edging Gov. Deval Patrick (D) in the race for governor, 35% to 34%, with Tim Cahill (I) at 11% and Jill Stein (G) at 4%. Add John Thune to the GOP 2012 Presidental list…..
New GOP Pledge feature has few..if any… black’s in promo’s….